It’s been a really busy time in the Kindergarten. In addition to our regular schedule, Christy and I have been out of our classrooms a couple of times each week for the last few weeks, completing our school district’s Kindergarten/Grade One Literacy Screener with our students, completing the Early Development Instrument (EDI) for participating students and attending Professional Development sessions. We are looking forward to returning to a regular routine with our students. Last week we wrote about the importance of getting your child to school on time. Over the next two posts we’ll explore, as teachers and parents, our thoughts about routines you can establish at home to help your child get organized in the evening so the mornings are not so rushed, an important factor in arriving to school on time. Which brings us back to our greatest comfort, routines. 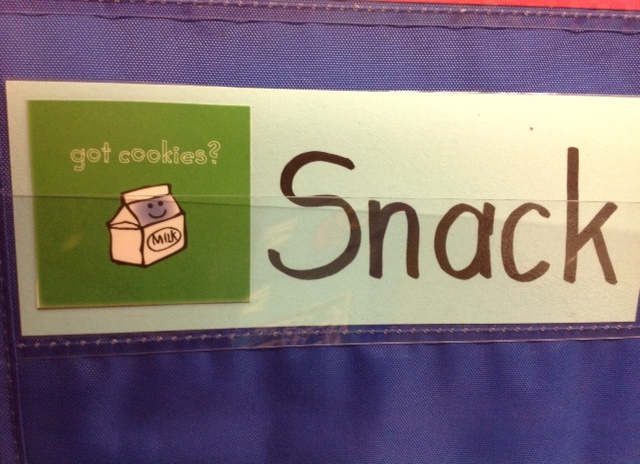 Let’s start with how we establish routines in the Kindergarten. Classroom routines are necessary for successful teaching and learning. From our perspective, classroom routines are one of the pillars of excellent classroom management which, in turn, is the foundation of successful teaching. Classroom management includes clearly established expectations and routines (sometimes called classroom structure); management of desired student behaviour; and organization of lessons in order to maximize student learning, process and productivity. In Kindergarten the classroom routines are established by us, the teachers. Partly from experience, and partly through learning about our new class each year, we create routines around student work (eg., Alphabet Books), student activities (Meeting Time, Centres) and any transitions in our class. A transition would be any time students are moving between activities or subject areas. Routines give our students security because routines establish boundaries around expected behaviour. The children know what is expected of them, and the other students. They feel safe because they know what they are allowed to do, and we teach them to peer-reference (look to others) if they are uncertain. The children want to please their teachers, they want to do the right thing, and when they feel safe and secure in their classroom environment, they flourish. Routines give our students predictability. Being able to predict or know, exactly what is going to happen next, allows the children to relax and be calm and contributes to their self-regulation. When the children are able to self-regulate their behaviour, all of their attention and positive energy can be focused on listening and learning, following the teachers’ instructions and having fun with their friends. Here is the visual Daily Schedule from our classrooms. We read it in three columns: the first column is the activities from the start of the day until snack time; the second is from morning recess to the end of the lunch hour; and the third is the afternoon. The children love the schedule because they know what’s going to happen in class next, when their breaks will be and when we get close to home time. The children often ask when they can go home during the afternoon as the full day in Kindergarten can be a long one. When we can show the children on the schedule how many activities there are before home time, they feel they can cope because they can count them down. 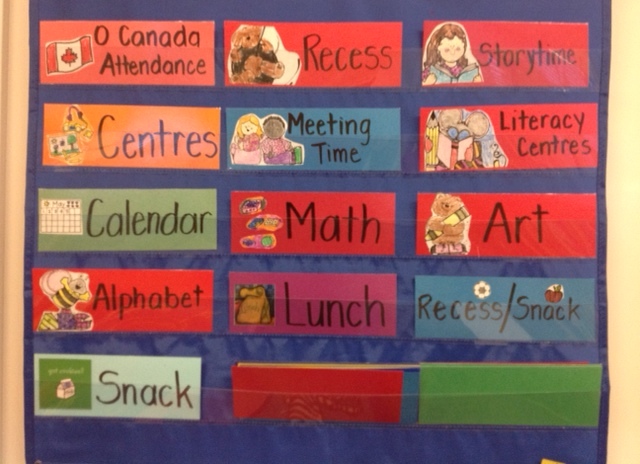 Reviewing this visual schedule is part of our morning routine right before Centres. Sometimes we remember to change it the day before, but lately we’ve started changing it with the children so they can see, and hear from us, how their day will unfold. The children are developing a sense of the passage of time, which we believe helps them to pace themselves throughout the day. resulting in a change in the schedule (eg., we forgot the gym is in use during our PE time for a school-wide event or we have to miss Centres to go to an assembly). 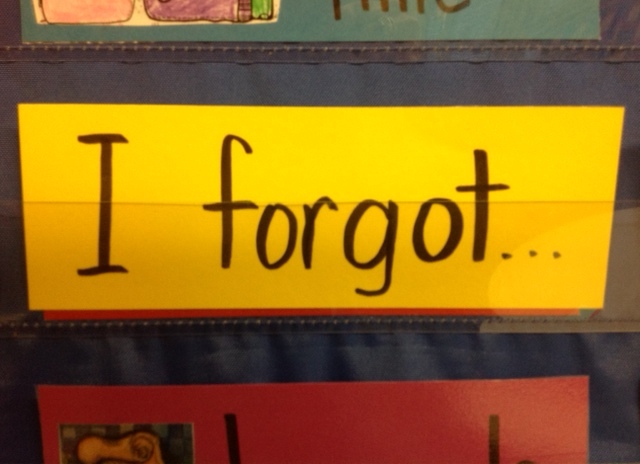 Each time we use the “I forgot…” card, it is an opportunity for us to teach our students about being flexible. We just place the card in front of the activity to be missed or moved to another time or day. Although there might be disappointment, a five-year old child is old enough to understand that sometimes what we planned for is not going to happen. Kindergarten children are able to learn to be flexible, adjust and accept the circumstances of a given situation. We try to positively use these experiences in class to teach our students to express their feelings and use a self-regulating strategy to help deal with their emotions. We begin teaching our classroom routines on the first day of Gradual Entry for Kindergarten. We start with a routine for how to sit at the carpet during Meeting Time (walk to the carpet; listen with your whole body: sit cross cross on your Alphabet square, hands in your lap, eyes are looking at the teacher, ears are listening to the teacher, mouths are quiet). We carefully explain what our expectations are, specifically praise the children for showing us the expected behaviour and in the days and weeks to follow, continue to practise and positively reinforce the desired routines and behaviours with more praise. From there we add our routine for Centre Time (walk to a centre, four to a group, quiet voices, share), and continue building in more routines through the months of September and October. Our students are becoming independent in the classroom as a result of learning routines. They are able to do many things for themselves and take a lot of pride from that independence. It’s certainly one of the big goals we want for our children as they grow up and move through the school years.